While I have written about reported birthdates ranging over several years, something else that happens from time to time is the reporting of death dates, especially gravestones, being off by a few years. Sometimes, when a gravestone date is off, it also creates an incorrect birthdate. This example involves Joel Chafee (usually spelled Chaffee) of Thompson, Connecticut. He is buried at Wilsonville Cemetery in Thompson and apparently has two gravestones, one that has fallen down and one that still stands erect. Both stones state essentially the same information, that he died 5 December 1863, aged 67 years, 2 months, and 9 days. As a consequence of this age on his stone, his findagrave entry currently credits him with a calculated birth of 28 September 1796. He is buried beside his wife Lavine (Morse) Chafee, who died in the same year, on 2 June. From her age on the stone, it would appear Joel and Lavine are the same age. I next tried to verify these events from vital records. I found Lavine’s death in Oxford, Massachusetts (two towns north of Thompson), with the date of death and age at death as given on the tombstone. However, this death record referred to her as widowed! 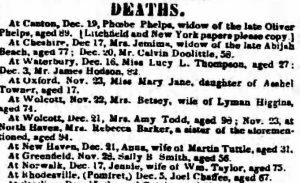 If Joel had died in December 1863, Lavine should still have been married. Joel and Lavine appear together in the 1850 census in Thompson, but she appears in the 1860 census in Worcester, Massachusetts, with her married daughter and without Joel. In the 1850 census, Joel is aged 63, which would be more consistent with a birth in 1786 or 1787, rather than his “calculated” birth year of 1796. 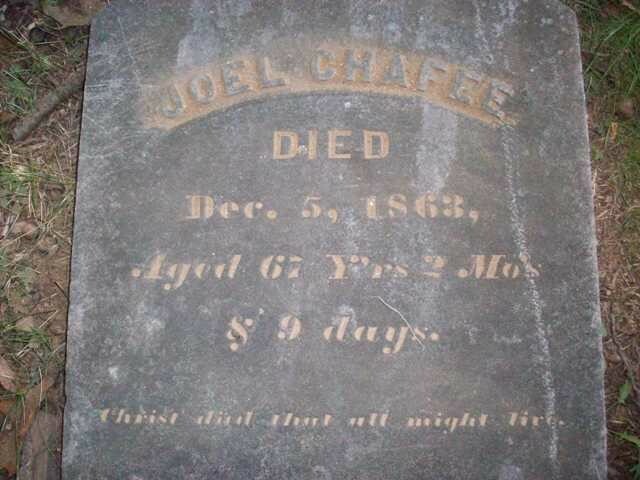 Turning to Thompson Vital Records, I find Joel Chaffee, son of Thomas and Mary, born on 27 September 1785. Hartford Courant, 21 December 1853, page 10, found on newspapers.com. 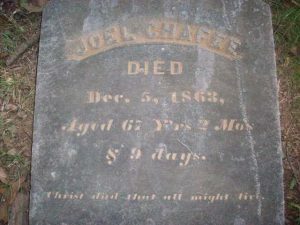 I suppose no grave was erected for the dates between Joel’s death and that of his wife, and perhaps the stone cutter made a mistake and assumed the couple had died in the same year, following all the other instructions accordingly. For some of our ancestors in the nineteenth century, a gravestone may be our only source for a death date. When possible, try to confirm that the year makes sense and is not off by a few (or ten!) years. 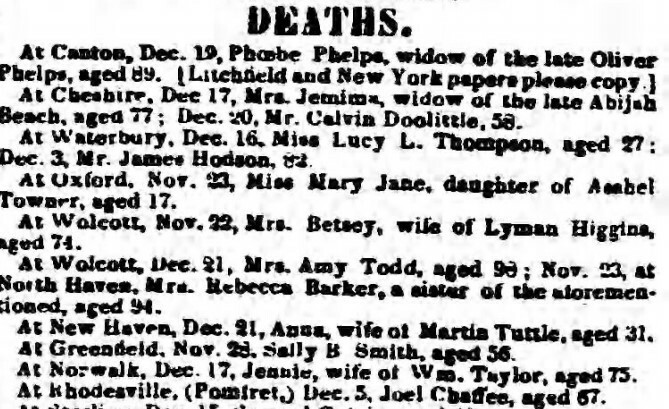 Massachusetts Vital Records, Deaths, 1863, 167: 261. Thompson Vital Records, 1: 17. Connecticut Probate Records, Thompson Probate District, Joel Chaffee, Thompson, 1854, No. 270. While this stone clearly says 1863, not all, especially older, stones are as clear. I have seen FAG and other transcriptions made when I know the year of death is different. A 6 or 5 or 3 or 8 or 9 can all look similar when aged. This might be a transcriber issue or if a stone is a replacement one, it could be stone carver issue. Or maybe the stone was not placed for many years after a death and the remaining heirs did not have accurate memories. Sometimes gravestones have inscriptions that make your head ache tring to figure out. The gravestone for my 3G Grandmother, Nancy Durgin, reads: “Nancy Wife of Clement Drew born 1782 Died 1823 – At the same time died their infant daughter – God cared for her orphaned Sophia until she too reached the shining shore in 1888.” Note that this last date indicates the gravestone was made 65 years after Nancy’s death, and after much searching I still have no idea who the orphaned Sophia was! Could that have been a daughter? Toni, thanks. if Sophia was a daughter she is the only child of Clements and Nancy’s not recorded anywhere. I have even searched for any Sophia or similar name, born between 1814 & 1832, and found no possibilities. Even that 1888 date could be in question. The late Keith Herring, the Eaton, NH, town historian had a theory that she was a Sophia Chesley, but I could not figure out who she could have been. Another Sophia chesley married Rev. Enos George of Barnstead, a reasonable location, but dates don’t work. The death date on the gravestone of my great-great-grandmother, who crossed the Oregon Trail with her family shortly after the Civil War, is off by an even decade. Since the gravestone is shared with her husband who didn’t die until 1926, I’m not sure whether the child(ren) who ordered it misremembered her death by ten years, or whether the year on the mason’s order form was written sloppily (so that ’09 looked like ’99), or what..but it is certainly a source of consternation for genealogical purposes! Thanks for the reminder that everything needs corroboration. Just finished researching a family in a local cemetery. On one marker is a married couple, two of their children that died as teenagers, and 4 grandchildren. Not one birth or death date on the marker was accurate – month, day and year all were wrong according to the vital records for each. At least I had the names to research.